Caritas shares the mission of the Catholic Church to serve the poor and to promote charity and justice throughout the world. They are inspired by the Gospels, by the teachings of the Catholic Church and by the hopes of people living in poverty. They encourage everyone to respond to humanitarian disasters, to promote integral human development and to advocate on the causes of poverty and violence. They animate Catholic communities and all people of good will in solidarity with the suffering of heir brothers and sisters around the world. Caritas responds practically to humanitarian crises such as natural disasters, conflict and the effects of climate change. They save lives, relieve suffering and help rebuild livelihoods and communities in the longer-term. This allows women and men in the poorest and most vulnerable communities to survive and recover from crises and to live in a safe and secure environment. The Caritas confederation has been responding to emergencies for more than 60 years. It’s a job Caritas does well – drawing strength and skills from its worldwide network. Actually, the Catholic Church is one of biggest healthcare providers in the world. It runs thousands of hospitals, clinics and dispensaries. Local Caritas organisations provide medicines for treatment programs in Caritas’s key areas of HIV, TB and non-communicable diseases. At the international level, Caritas advocates for access to medicines and care. 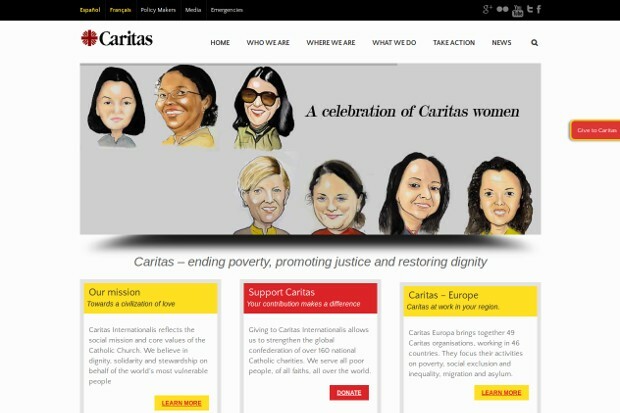 Finally, Caritas campaigns for proper legal protection and just treatment – especially for women and child migrants as they are the most vulnerable to abuse and for an end to domestic slavery and the trafficking of human beings.